Offering water boat tubes rentals and tours with our wakeboard boat and watercraft rentals. We carry all different kinds of tube rentals including single rider, double, triple, and four person inflatable water towables for rent. These are a must have water toy at Lake Powell while on vacation. Water tubing is so much fun for all ages, and is a must for any Lake Powell vacation or lake tour; our company offers boat tube lessons and charters for those who would like someone to drive the boat. We carry Hyperlite, Connelly, and HO water tubes which must be rented with your jet ski or wakeboard boat. 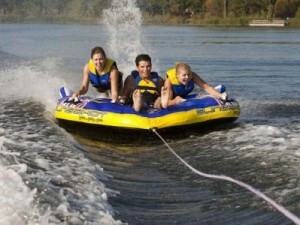 You will love our selection of inflatable water tube rentals.